Chemtrails and Chemtrail Legislation - Chemtrails Spraying and Chemtrail Legislation - CHEMTRAIL LEGISLATION Chemtrail Information - Stop Chemtrail Spraying in California! Our elected representatives are responsible for protecting public health, the health of our children, pets, wildlife and our trees. If you are experiencing these symptoms after heavy jet spray days, please contact your elected representatives. Pets and other animals may be subject to chemtrail symptoms. In form your doctor about what is happening in your neighborhood. haven't passed are cleared from the books. This bill never became law. 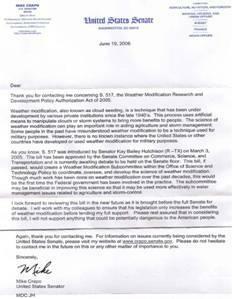 Mike Murphy, director of the upcoming film “What In The World Are They Spraying?” documentary on ChemTrails, took this letter below and other documents to Washington DC. He was able to speak with ‘key’ people from both the US Senate and the US Congress ~ including chair people in sub-committee of Science and Technology. Mike will be on my show Visionary Culture Radio Wednesday, August 4, 7 pm pst, 10 pm est. We will talk abou this letter, the situation with Chem Trails, and research Mike has done around this topic. You can set a SHOW REMINDER and you will also be able to listen live via telephone, at www.visionaryculture.com , and after the live show, via the ARCHIVES. This letter is a statement of your constituents and other citizens throughout the United States. We declare that, on nearly a daily basis, we witness the deployment of aerosol releases in the skies above our homes and other populated areas. We observe long lines of lingering substances discharged from planes in manners inconsistent with incidental and naturally dissipating contrails. “X” shapes, criss-crosses, grids and dot-and-dash patterns do not occur incidentally or naturally, proving these aerosol-releasing activities to be intentional and human-deployed. From the ground, these jet aerosol operations resemble proposed geo-engineering programs which are planned to be introduced under “Solar Radiation Management” [i] programs. The sprays released from the jets appear to expand into man-made clouds which diffuse until the sky is blanketed. Ultimately, a complete “white-out” of the sky results. The unnatural, xenobiotic “cloud”, then gradually moves to ground level, where humans, animals and plants absorb its harmful contents. This geo-engineering spraying, called “chemtrails” [ii] by some, but falling under what is to be announced this month by your Committee as “Global Geo-engineering Governance”, is illegal under international law as well as under the law of the land in the United States of America.. According to the 5th article of the Bill of Rights, amending the Constitution for the United States of America, “No person shall be…..deprived of life, liberty, or property without due process of law”. The daily geo-engineering spraying, by the US or other unknown military aircraft, is depriving all persons living within the United States, of life (and health), liberty, and (integrity of our common and private) property without due process of law. Under US Title 50, Chapter 32, § 1520 (a) “Prohibited activities”, the Secretary of Defense (and his agents), “may not conduct (directly or by contract) – (1) any test or experiment involving the use of a chemical agent or biological agent on a civilian population; or (2) any other testing of a chemical agent or biological agent on human subjects.” Since geo-engineering programs, as discussed at a recent scientific conference on the topic in San Diego[iii] (3), are represented by their developer-promoters as involving experimentation and testing upon civilian populations, those being carried out on the US and other populations are in violation of Title 50, Chapter 32, § 1520. Title 50, Chapter 32 §1520 (c) provides an exception to the above, where informed consent has been obtained in advance from each individual test subject. However, whereas there exists no informed consent from Americans generally or individually to be exposed to geo-engineering-related releases – indeed, signatories to this letter, and those they represent in their respective organizations, hereby declare they do not consent to be exposed to such aerosol spraying – the current releasing of aerosols over the US and other populations is illegal and must be halted at once. According to United States environmental law, an environmental impact statement[iv] is required by the National Environmental Policy Act for federal government agency actions “significantly affecting the quality of the human environment”. No such statement, study, or analysis has been provided for the current geo-engineering activities in our atmosphere. Geo-engineers are proposing injecting 10 to 20 Million tons of aluminum and barium into the atmosphere for the stated goal of cooling the planet. Tests from around the world reveal massive amounts of aluminum and barium in the rain, snow and soil. [v] These tests suggest that these programs are not only a threat to human health and ecology, but have also been on-going for several years. In various communities across the United States, Americans have collected samples of fallen particulates and substances that match geo-engineering proposals and substances listed in the Hughes Aircraft patent. [vi] Additionally, ground-level air particulate levels and biological effects have been noted, such as new plant disease increase and the orders-of-magnitude decline in quantity of fish in areas with heavy geo-engineering activity. We declare we do not consent to any Global Geo-engineering Governance, nor to be exposed by any means to geo-engineering-related hazardous substances, regardless of the delivery mechanism, and urge you immediately to modify your stance on such Governance. We additionally demand a set of hearings – minimally three – to include expert testimony of opponents of geo-engineering, in advance of and preparation for your final report, due in September 2010. To date, any such hearings have excluded opponents, despite the fact that every person, having already been and about to be further exposed to harmful atmospheric releases, has a vital interest in this matter. Congressman Dennis Kucinich had tried some years ago to put a stop to these hazardous releases, referring in the bill to some geo-engineering programs as “chemtrails”. However, he was not adequately supported by other members of Congress. That state of affairs must now change at once; for geo-engineering, which is fully intended to alter the bio-system in very significant ways, vies with the Gulf oil rig disaster in terms of its likely permanent, global damages. As a representative of the people of the sovereign states comprising the United States of America, we insist that you do everything in your power to protect us and immediately put a stop to geo-engineering spraying at once. There exists no justification, legal or otherwise, to poison the planet and its inhabitants. To establish the Weather Mitigation Research Office, and for other purposes. In General - not later than January 31, and annually thereafter - the Director shall prepare and submit an annual report to the President , the Senate Committee on Commerce, Science, and Transportation, and the House of Representatives Committee on Science and Technology on the activities conducted pursuant to this Act during the preceding calendar year. Appropriated to the Office for the purposes of carrying out this Act are $25,000,000 for each of the fiscal years 2010 through 2014. WEATHER MITIGATION - The term ‘weather mitigation’ means the purposeful or inadvertent changing or controlling, or attempting to change or control, by artificial methods the natural development of atmospheric cloud forms or precipitation forms in the troposphere. COOPERATION WITH OTHER AGENCIES - The Director may cooperate with public or private agencies to promote the purposes of this Act. COOPERATIVE AGREEMENTS - The Director may enter into cooperative agreements with the head of any department or agency of the United States, an appropriate official of any State or political subdivision of a State, or an appropriate official of any private or public agency or organization to conduct research and development pertaining to weather mitigation. WORKING GROUP - Other members shall have expertise in one or more of the following areas: (i) Cloud dynamics. (ii) Precipitation physics. (iii) Nucleation theory. (iv) Hydrology. (v) Water management engineering. (vi) Numerical modeling of cloud systems. (vii) Hail and fog. (viii) Social sciences. (ix) Lightning. (x) Any other area of expertise deemed necessary by the Director. PROGRAM ACTIVITIES - The national research and development program required by section 5(a) may include the following activities related to weather mitigation: A) Research related to cloud and precipitation physics. (B) Cloud dynamics and cloud modeling. (C) Improving cloud seeding-related technologies. ( D) Severe weather and storm research. (E) Research related to potential adverse affects of weather mitigation. ELIGIBLE ENTITIES - For purposes of this subsection, an eligible entity is a State agency, institution of higher education, or nonprofit organization that has– (A) an established background and expertise in the field of weather mitigation; and (B) experience with working with and coordinating with State agencies ( e.g. The Rockefeller Foundation, author´s remark). United States Senator Ron Wyden of Oregon is asked about Chemtrails . Town Hall Meeting in Hood River Oregon on February 19th, 2009.